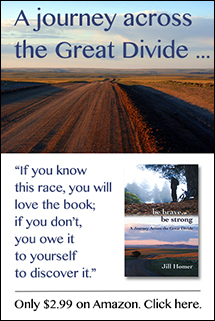 “Be Brave, Be Strong” is the true story of Jill Homer’s challenge of “the world’s toughest mountain bike race,” a 2,740-mile journey from Canada to Mexico along the rugged spine of the Continental Divide. Also available for iPad and other eReaders. “Ghost Trails” is Jill Homer’s first memoir, exploring a series of life adventures that helped her grow from a timid Mormon girl from the suburbs of Salt Lake City into a contender in a 350-mile wilderness bicycle race across frozen Alaska. Also available for iPad and other eReaders. This anthology chronicles the adventures of an unlikely athlete who takes on harsh challenges in the frozen wilderness of Alaska, the Utah desert, and the Himalayas of Nepal. Endurance racing, cycling, travel, trail running, and self-actualization amid stunning outdoor landscapes are common themes in these compelling vignettes about “The Adventure of Life.” Also available for iPad and other eReaders. The Cordillera is a literary journal of racing on the Great Divide Mountain Bike Route. The book features essays by an artist who questions his own life in New Mexico, a young racer grappling with poor decisions in New Mexico, and a woman who finds hidden joy on the Fourth of July. An award-winning feature film about the Tour Divide, traversing more than 2,700 miles along the Continental Divide in the Rocky Mountains. The film weaves the story of three characters’ experiences with immense mountain beauty and small-town culture as they attempt to pedal from Banff, Canada, to a dusty crossing on the Mexican border. Relentless Forward Progress is a how-to manual for aspiring ultrarunners. Author Bryon Powell covers every aspect of training for and racing ultra distances. Along the way, more than a dozen runners and experts, including Geoff Roes, Krissy Moehl, Michael Wardian, Dave Mackey, and David Horton, provide invaluable advice on running ultramarathons. A veteran journalist and environmental editor who harbors deep anxiety about our longterm prospects, Ed Ayres aims to understand how the skills and mindset necessary to complete an ultramarathon are also essential for grappling anew with the imperative to endure — not only as individuals, but as a society. Marshall Ulrich has run more than one hundred foot races averaging over one hundred miles each, completed twelve expedition-length adventure races, and ascended the Seven Summits — including Mount Everest — all on his first attempt. Yet his run from California to New York, the equivalent of running two marathons and a 10K every day for nearly two months straight, proved to be his most challenging effort yet.